San Remo (or Sanremo) is a popular resort town on the west coast of Italy, best known for its casino. But there's a lot more to do and see in this beautiful city on the Italian Riviera if you're not interested in gambling. La Pigna, the Pinecone, is the oldest part of the city. La Pigna's tiny streets and covered alleyways wind up the hill to the gardens and sanctuary at the top. Some of the historic buildings, churches, and squares have been restored, and there are signs describing them along the tourist itinerary. Madonna della Costa Sanctuary, on the hilltop above La Pigna, can be seen from most places in San Remo and is a symbol of the city. A beautiful cobblestone mosaic dating from 1651 leads the way to the sanctuary. The dome atop the sanctuary was erected between 1770 and 1775. Inside are an ornate altar and organ and beautiful paintings and statues dating from the 17th to 19th centuries. The Russian Orthodox Church was finished in 1913 when San Remo was a popular winter destination for Russians. It's similar to the church of San Basilio in Moscow. The Gardens of Queen Elena are on top of the hill above La Pigna, and there are other beautiful gardens around the city, in Villa Zirio, Villa Ormond, and Villa Nobeland Palazzo Bellevue. Recreational sports are plentiful in San Remo. There are several tennis clubs, bicycling, two harbors, a public swimming pool and beaches for swimming. San Remo is famous for its Italian Song Festival, held in late February. There's also a European music festival in June, a rock festival in July, and a jazz fest in August. Many other shows and concerts are held throughout the summer months. From October through May, the Opera Theater at the casino holds performances by the Symphonic Orchestra. New Year's Eve is celebrated with music and a big fireworks display by the sea at Porto Vecchio, the old port. The San Remo Flowers parade is held at the end of January. Many sports events, including water sports, are held throughout the year, too. 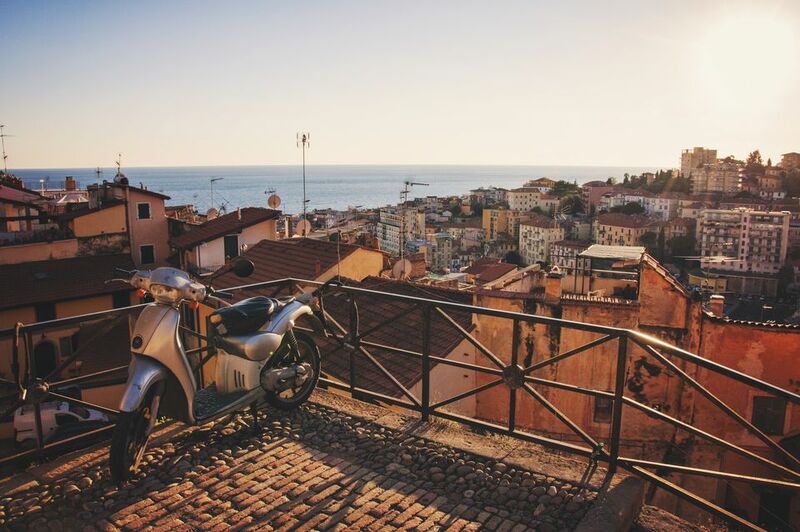 San Remo is a good year-round destination. The Riviera dei Fiori has milder temperatures than many places in Italy and since it's a fairly large town, most hotels and restaurants stay open even in the winter. Summer can be very crowded with higher hotel prices than you'll find during the offseason. Of course, San Remo's century-old casino is itself is a magnificent work of architecture, built in the Liberty Deco style. Visitors can enjoy the theater and restaurants located inside the casino, which is right in the center of the city. The casino is connected to the Piazza Colombo and Via Matteotti shopping and entertainment area. San Remo is between Genoa and the French border in the part of Italy known as the Riviera dei Fiori, or riviera of flowers. It's in the province of Liguria. San Remo can be reached by train or bus from other towns along the coast, and it's on the coastal rail line that connects France with Genoa and other points along Italy's west coast. The train station is above the harbor, and the bus station is near the center of the city. By car, it's about 5 kilometers off the A10 autostrada (toll road) that runs along the coast. The closest airports are Nice, France, about 65 km away and Genoa airport, about 150km away.